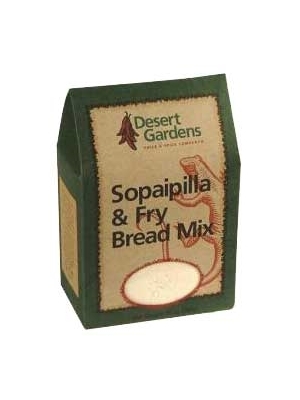 The traditional sopapilla is a well known Southwestern treat! Serve with honey, cinnamon, sugar or powdered sugar for an out of this world dessert! As a fry bread, top with refried beans or your choice of cheese and ground beef for a special Southwestern meal! Add water to mix slowly. Fold dough over until smooth. Cover and set aside for ten minutes. Heat about three inches of oil in a pan. (350 - 375 degrees) Roll dough to 1/8 inch thickness on lightly floured surface. Cut dough into 4 inch squares. Fry until golden on both sides turning once. Drain on paper towels. Serve with honey, cinnamon, sugar, or powdered sugar. Enriched unbleached flour (wheat flour, enzyme, ascorbic acid, niacin, reduced iron, thiamin mononitrate, riboflavin, folate), leavening (sodium acid pyrophosphate, sodium bicarbonate), sugar, salt. This bread goes well with the corn chowder soup!